The man is back! Denis Cooper is talking Modern Times beer, available right here at Fresh Choice Nelson. In these modern times of increased technological advancement where smart phones have enough power to blow your mind it’s not easy to keep up with the play. 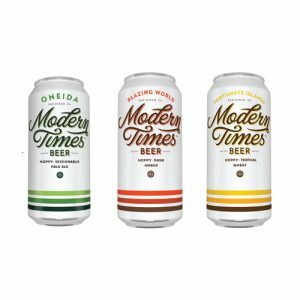 Fortunately there is a brewery to help ease the pain: It is called Modern Times, and it is located in San Diego where it was founded by Matt walsh, a brewer with a fondness for New Zealand and NZ hops. Here’s the twist… Matt named the brewery not after the latest high-tech brewing wizardry but because Modern Times was a utopian community built on Long Island in 1850 by a bunch of ferals who thought they could demonstrate what a perfect society might look like. Hopefully, says Matt, Modern Times Beer will be one of those utopian pockets too. Hence the weird names of his brews, but only the labels, the beers are very urbane. Oneida Sessionable Pale Ale – I love this guy, he makes a sessionable hoppy pale ale with a whopping 5.8% – sessionable mmmaybe? Anywho, this brew is dang good. Brewed as a spring seasonal so perfect for this time of year. Blazing World – Labelled a 6.8% hoppy dank amber ale. White grape skins and rhubarb dominate with a hint of weed… Hhhhm, is that what the dank refers to? Fortunate Island – A wheat ale with citrusy tropical hops notes. There is just enough wheat character to develop a refreshing finish that’s as long as the AB’s winning streak. Halfway to Whangarai Grissette – A collaberation brew with NZ’s 8 Wired Brewing. Presumably named after the location of 8 Wired’s brewery at Warkworth, which is kind of utopian! The Grissette style of beer is kinda like a saison except instead of being the beer for Belgian farmers it was the beer for the Belgian miners. Halfway to Whangerai has a double fermentation process which results in a flavour profile as complex as the Nelson recycling system. Includes notes of lemons, cloves and cinnamon with a slightly tart, tingly finish. So hit the hoverboard and slope down to Fresh Choice Nelson, the city’s best utopian craft beer pocket, where we’ll be tasting Modern Times, 3:00 p.m. to 6:00 p.m. this Friday!